Hello everyone. I'm new to this forum and am having loads of fun trawling through all the old Glasgow stuff. I find all this stuff fascinating - always have done - and in my job as a delivery driver I see plenty of Glasgow and evidence of what once was part of our city. Was wondering if anyone could help me out with a little project I'm working on. I'm looking for old pictures of junior football grounds in the city, particularly the ones I've listed at the bottom of this post. I've tried the Mitchell and haven't had a whole load of luck so far so any help is much appreciated. and any other junior grounds in the Greater Glasgow area. A cursory search of this site alone throws up at least two. There might well be more. Schiehallion's link to the juniors site doesn't seem to work any more, though. Thanks Josef. I already have those photos apart from the colour version of Peasie Park. I attended the old Petershil Park a number of times before it was demolished and it was one of my favourite grounds. It was a shame they replaced it with the soul-less plastic venue now situated on top of the hill. I believe the stairs leading up to the terracing are still intact so I will try and get a couple of snaps and post them. Any other old pics of grounds are welcome. 1. Springfield Park, off Springfield Road, Dalmarnock - Former home of Strathclyde Juniors, another succesful club and rival of Parkhead's. Since this pic was taken, the land has been almost completely cleared to make way for the Commonwealth Athletes Village. Strathclyde also ceased to be during the mid-60s. 2. Helenslea Park, Helenvale Street, Parkhead - Former home of Parkhead Juniors, a very successful junior club from the early 20th Century, only half the terracing shown in this picture still remains due to some new construction. Parkhead went bust in the early 60s. "Parkhead Football Club", was a founding member of the Scottish Junior Football League but the team now no longer exists. It played at Helenslea Park in Parkhead, Glasgow. In the early years of the Scottish Junior Cup , Parkhead Juniors was, if any the dominant team. It appeared in 9 finals and won the cup 5 times - in 1899, 1902 ,1915, 1920 and 1924. Across London Road from Westthorn Park you will find the site of what used to be the home ground of Parkhead Juniors Football Club. Founded in 1880, it was the oldest team in the Scottish Junior League. The entrance was in Methven Street. Parkhead Juniors seem, like a lot of Lilybank , to have disappeared from history. Though they were still playing in the 1950s, they went defunct in June 1963. During the mid 80's I believe the park was transformed as part of the G.E.A.R. (Glasgow East Area Renewal) project into a Skateboarding/Cyclepark and all that remained of the old football ground was gone forever. fao: busdriver - I'm informed Parkhead's ground was on Helevale Street (see above post and disused terracing). kenny1986 wrote: fao: busdriver - I'm informed Parkhead's ground was on Helevale Street (see above post and disused terracing). You've been misinformed, Kenny. See here or several places on HG for the history of Helenvale Park, which is the ground in your photo. Thanks for clearing it up guys. The info I got was from an old Maryhill Juniors football programme which described Parkhead's ground as being in Helenvale Street - they obviously got confused between Helenvale and Helenslea - so thanks for confirming it for me! I think I'm right about Strathclyde's ground though! 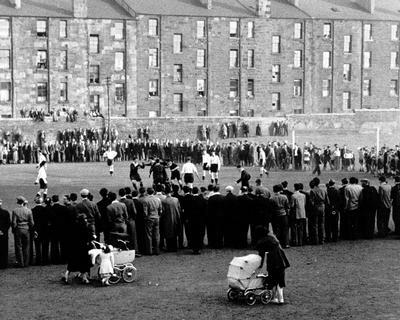 A crowd gathered to watch a football match at Plantation, 1955. The players in dark jerseys appear to be celebrating a goal. The Fifty pitches @ Linthouse/Govan have also been taken up by an office development. Superb link Alan thanks very much.The picture of the derelict clubhouse at Carnoustie Panmure brings back memories as thats where we used to go at 16 for an illicit pint or two on a friday. old St Anthony’s FC ground. The old White City dog-track is in the foreground, just in front of Bellahouston Park. The venue was for a time also the home of the Glasgow Tigers speedway team. A previous thread ( maybe) relating to this one. Hervey wrote: Might be flats soon? Going back to its original use. Was a miners' row until approx 1900. My grandparents lived there before being relocated to Silverbanks St at the beginning of the 20th century. Mori, I had a good look at the older of the two pictures you posted and I'm not sure if the ground you refer to as the "old St Anthony's FC ground." is the one to which you are referring. The old St Anthony's FC ground is barely visible in the picture on the east side of Helen St. somewhat removed from Ibrox. You have clearly identified the old White City dog-track as being in the foreground just in front of Bellahouston Park. The track and field just west and slightly south of Ibrox Stadium I believe was the Albion Dog Track. I have the notion this is the park you refer to as St. Anthony's; if I've got it wrong...sorry!